The International Trade Exchange's 22nd International Convention was held in St. Petersburg (FL) May 24 - 27. "Catch The Fire" was this year's theme as ITEX CEO Steven White welcomed 130 staff, franchisees, and independent licensed brokers for the four day event. One which, according to White, "focused on ways for ITEX to build greater market share." Alan Zimmelman, VP of Operations, reports that ITEX plans to aggressively grow its existing broker offices through sales incentives and acquisitions of competitors in its current marketplace. Over $300,000 in cash was distributed among 75 brokers for trade volume increases and sales performance incentives at the convention. On Friday, May 28, the day after the convention closed, ITEX stock (OTCBB:ITEX) traded almost a million shares (as well as trading at its 52-week high) increasing in value by 80% for the week. 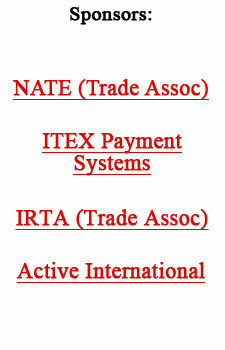 For more information: www.itex.com. The North San Antonio Chamber of Commerce has 1,400 members, one of the largest chambers in San Antonio. But they're not resting on their laurels. The Chamber has just formed a strategic alliance with 23-year-old Alamo Barter—the largest barter firm in Texas—with the goal of improving their event funding programs. A focused campaign will begin immediately. Alamo Barter's VP Victor Castano explained, "The Chamber will reap the benefits of both greater financial strength and support of its initiatives, in addition to providing an opportunity for its members to support the organization's growth and influence by providing items that can be traded during fund-raising events. And," he added, "using Alamo's promotional, marketing, and advertising availabilities will also enable the Chamber to gain greater exposure for its many events and activities." If You Thought 1994-1999's Internet Explosion Was Exciting... Just Wait!! Most of us are aware of, and have possibly used, WiFi the wireless protocol that transmits internet signals as far as 300 feet to provide "hot spots" at coffee shops, airports, and hotels as well as for personal networks at home. Well, in the not not-too-distant future WiFi will be replaced with WiMax...a brand new technology that sends signals up to 30 miles. It's been referred to as WiFi on steroids! It'll be the tool to deliver internet access to remote or underdeveloped areas of the world, ones that don't even have telephone service. Think of the incredible possibilities and opportunities that will unfold. This technology-introducing the broadband wireless era-will bring the next 5 billion people to the Internet, as our world continues to evolve and change! A recent issue in online magazine Forbes.com ran an article on the barter efforts of billionaire Jon M. Huntsman. It reported that in the early days his company, Huntsman Container, was able to survive only because of a barter transaction. During the OPEC oil embargo in 1973, he traded ethylene to get polystyrene which was needed for manufacturing the "clamshell" containers that Huntsman sold to McDonald's...to house the "Big Mac." Today Huntsman has a net worth of $2.5 billion, and is the majority owner of the largest private chemicals company in the world. Huntsman attributes his barter endeavors to the subsequent growth and expansion of his company. "It was barter that gave me the idea of getting into the chemical business instead of staying strictly in packaging, it opened the door to us of a whole new world we had never seen before. Through bartering, we learned an entire new industry. "We learned the names of products, who produced what, and how terribly bureaucratic and unknowledgeable these big chemical companies were. They didn't know what products they needed or which ones they had on hand. We always seemed to win on each barter deal. In fact, we had never made so much money so fast." In the eight-month period of the OPEC oil embargo, Huntsman made $5 million through his barter organization called Huntsman Trading. He used part of the money to increase his ownership in Huntsman Container to 60% up from 40%. With the remaining $3 million, he began to participate in the business in which he now excels—the petrochemical markets. Today, Huntsman is planning to raise billions through a public offering or a merger in the near future, and then use the proceeds to fund his charitable activities. The story of WiMax technology, earlier in this issue, shows technology's relentless march forward. Another interesting development is the government's recent announcement to build a record-setting supercomputer. The Oak Ridge National Laboratory project, where they will be installing a Cray system in 2006, will have a capacity for 100 trillion calculations per second...increasing to 250 trillion by 2007! EValues.net continues its expansionary efforts, according to CEO Gary Lasater, as over 7,000 business accounts have been imported from seven independent exchanges over the past three months. For more information: www.eValues.net. But China is pushing tourism on a more massive scale. Beijing won its bid to host the 2008 Olympics, and Shanghai will hold the World Expo in 2010. In the '90s, international visitor arrivals to China increased by 11% a year, while global tourism grew by 4.3% a year. However, over the next decade, the World Tourism Organization anticipates total arrivals of business and leisure travelers to China will grow 22% annually. Current retirees who are 67 years old have a median wealth of $448,000 (2003 dollars). Of the 77 million baby boomers, those born from 1946 to 1955 are expected to retire with assets of roughly a third more than that, or $589,000, according to a study by the Urban Institute, a Washington think tank.